Need advice about keeping your home warm, heating it safely or struggling to pay bills? First Contact Plus runs the Warm Homes service for free advice and information on ways to reduce heating costs and stay warm in your home. For advice call the team on 0116 305 4286. 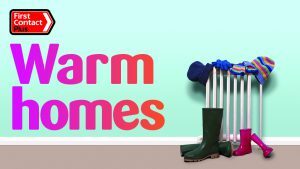 Residents can benefit from a home visit by the Warm Homes Officer providing free energy saving items such as LED light bulbs, radiator reflectors, chimney balloons and much more. Checking energy tariffs – are you paying more than you need to on your energy bills? Citizens Advice Bureau (CAB) – The Citizens Advice Bureau provide free advice on budgeting, debt and benefit issues. This link provides details for local offices in Leicestershire. 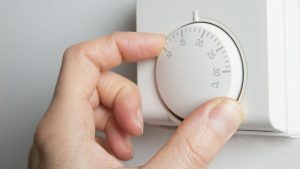 Some energy suppliers offer grants to help customers who might be struggling to keep their homes warm. Please speak to us regarding Warm Homes advice on: 0116 305 4286. As part of their licence obligations, domestic gas and electricity suppliers must offer special services to customers who are vulnerable and/or have a special need. Some suppliers include young parents on their priority service register. Priority in an emergency, this could include being provided with alternate heating and cooking facilities in the event of a disconnection. If you’ve used the oven to cook, leave the door open after it has been switched off to let the hot air circulate. One thick layer won’t keep you as warm as plenty of thin ones so pile them on. Thinner layers are often cheaper to buy too. A few candles can give off a surprising amount of heat, just be careful where you put them and never leave them unattended. Keeping furniture away from radiators and removing items from beneath them enables the warm air to circulate around the room. By keeping the door shut, the room you’re in will heat up more quickly and stay warmer for longer. Closing the doors of rooms not being used will also help to keep out the cold. Using draught excluders against your front and back doors is a cheap way to keep out the cold. Rather than reaching for the thermostat, try sitting on a low wattage heating pad. Draw the curtains at night even in rooms not being used to prevent heat escaping through your windows. Don’t forget to open them again in the morning to let any sunshine in to heat your home for free. Fill up a hot water bottle and switch off your heating before you go to bed. Make sure it is set to come on again before you get up to avoid frosty feet! Please refer to the link below in Useful Resources; where you can complete a registration form. Harborough Energy Leaflet Harborough District Council is working with Harborough Energy on the Warmer Homes Project to help residents take advantage of FREE cavity and/or loft insulation. Warm Homes Support Harborough District Would you like a warmer home, reduce bills and find out more about grants. Home Energy Advice Information Support schemes for help with payments and advice in regards with your home. Stay Well This Winter – Get Ready for Winter Advice to Protect Your Property this Winter. Stay Well This Winter – Keep warm and well this winter It’s important to keep warm in order to keep colds, flu and other more serious illnesses at bay. Turn2us Turn2us is a national charity which provides financial support to help people get back on track. With Regards to the boiler being fitted...the Warm Homes Officer "was a lovely guy, spot on".